I had one jar left of the kind of peanut butter that I think makes the best (crispiest) peanut butter cookies. My plan had been to save this jar for cookies, so I tucked it in the back recesses of the pantry. One afternoon, last week, I mixed the dough and set it in the fridge until the next day when I had time to bake it all. I took great care to make my peanut butter cookie balls just perfectly sized. I smashed them with a fork, just right, bake them at the proper temperature. My plans were good, but in practice, it just didn't work out. I burned the bottoms of 2 trays of peanut butter cookies! Ouch! This is normal, right? 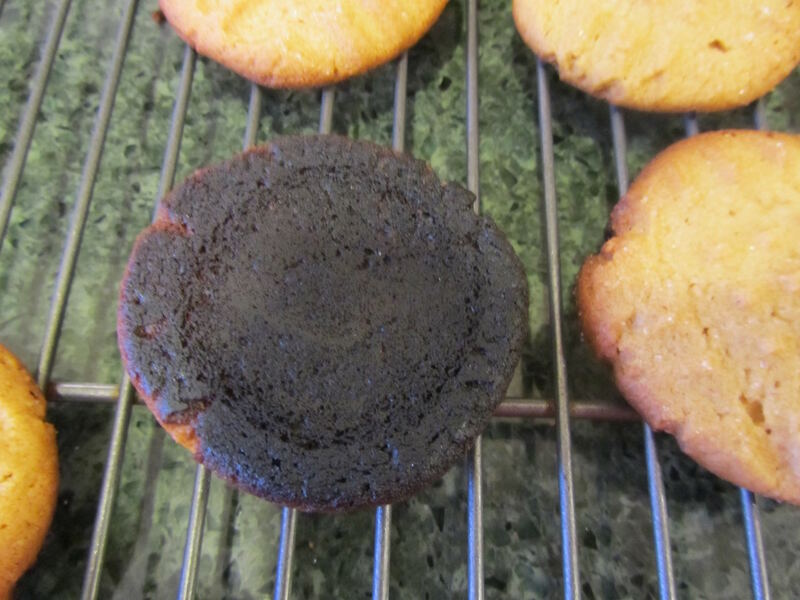 You'd scrape the bottoms of burnt cookies, too, right? Just trying to normalize some of the frugal, but sensible, things that frugal folks do. Indeed, yes, I would (and have, on innumerable occasions!) have scraped off the burned cookie bottoms. If that's somehow wrong, I don't wanna be right! I'm so glad to hear that other people think this is just normal, and what you do! I couldn't imagine not scraping the bottoms of burnt cookies or anything else. I would use them as well. 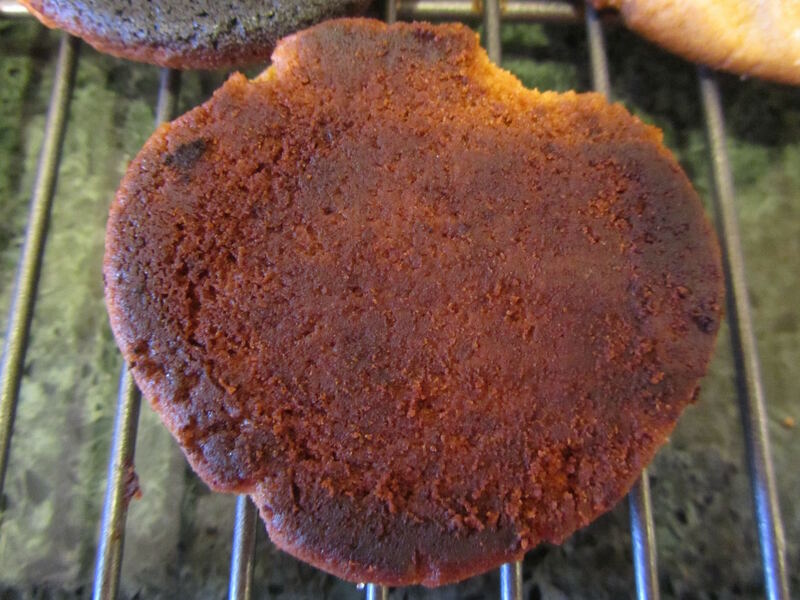 But I rarely have them now that we use silicon mats for baking (purchased at a deep discount, of course!). Makes a huge difference. I didn't know that silicon mats were good for preventing burning the bottom of baked goods. Good to know! And I also scrape off burned portions from toast. I noticed someone turned the knob to a darker setting and I kept burning the toast. I set it back. I also burned chili this week so I scraped off the "good" part from the top, careful not to scrape up any burned from the bottom. I'll do just about anything to save something . I had a small scorched spot in the bottom of a pot of BBQ pork the other night. I was trying not to scrape it up, but it somehow got mixed into the rest of the meat. And no one even noticed! That's how I feel, too! That I'll do what it takes to save something. And that just seems sensible to me. It's really hard to believe, but I do know several people who would have thrown out the cookies, or burned toast, or scorched chili. I ate 3 of the cookies, burned, myself, as I was scraping (so I wouldn't have as much scraping work to do). They weren't horrible, but the scraped ones were much better. Hmmm, burnt veggies. I've burned squash before, not too terrible. And I think I've burned a few green beans at the bottom of the pot, but those are easy to just pick out. If you burn a more than a few green beans, they stink really bad and its hard to save the pot even with taking out the burnt ones and adding a potato to absorb odors. While we have eaten salvaged veggies, I do remember one pot of green beans that didn't even make it back into the house for a few days. tI smelled that bad. And if there's enough of the burned green beans at the bottom of the pot, or any other veggie, it may be hard to salvage the pot, itself! With some items, I can "sell" it to my family that it has natural smoke flavoring added! But can see how a potful of burnt green beans wouldn't go over too well. Maybe add a bunch of cayenne pepper and call it Cajun? Blackened Green Beans? I had a bread incident at my house last week. We were having soup for supper, and I wanted to make bread to serve with it. A couple of days earlier, I'd seen an easy, no knead bread recipe on a blog. Seriously, the author had posted a link of a video on YouTube of a 3 year old making this bread. I watched the video, read the recipe and the blog comments...the general consensus was that the bread was easy to make and the results were amazing. I mixed the flour, salt, sugar, egg, milk, yeast and warm water as directed and covered the bowl. I allowed the dough to rise for 30 minutes as directed. The dough looked perfect, I poured it into two loaf pans and baked at 425 degrees as directed (the recipe said for 40 to 60 minutes). Well, the first thing I noticed was that the tops of the loaves seemed to be browning too quickly. It did not go well from there. At 40 minutes, the tops and bottoms of the loaves were too brown but the insides were still doughy. I finally had to remove the loaves because the bottoms were actually burning. I was so disappointed. The outsides of the loaves were burned and rock hard. I didn't know if any of it was edible. After cooling, I cut into one of the loaves. The very middle was doughy, but everything else on the inside was edible. So, what did I do? I cut off the burnt tops and bottoms, cut out the doughy middles, and sliced up what was left. It tasted okay, so we buttered it and ate it with our soup. I still don't understand why this recipe didn't work for me, but at least some of it was salvageable. good save on the bread! How frustrating, though, to have followed the instructions and then to have it turn out like that. I am just picturing, you and your family sitting down to dinner, with bows of soup, and crustless slices of bread with holes cut out of the middles of each slice! Good work on saving that bread, though!! My husband started the practice of sprinkling water over the bread loaf as it is baking in the breadmaker. He learned this from a recipe for baking double crust apple pies. He said that way it is easier to slice when the top is not too dry and burnt. 425 degrees does sound a bit high too. good to know about sprinkling the tops of loaves with water! Thanks! Years ago Amy Dacyhsyn ( sp) from The Tightwad Gazette showed how she would scrape the bottom of burnt cookies on a box grater to eat them and not throw them out. She did it on the Phil Donahue show( wow I am ancient) . The audience poo pooed it as if you have to be that " cheap" you have a problem. I remember thinking I have no time to be able to recook the cookies, buns, casserole. The fact I saved money was the bonus. You know, it wasn't just the food waste, I was considering. But it DID take time to mix the dough, get the balls of dough ready and into the oven! So, thank you for bringing that element up! Whereas, I think I only spent about 10-15 minutes total in scraping them all. I'm in the "how much time did I put into this?" camp. I would have tried scraping, as well. I find I am more likely to scorch something on the stovetop, though, rather than burn it in the oven--probably because I am trying to accomplish too much at one time. I have a Silpat cookie pan liner (it was a gift) and I agree with Cat, they do seem to reduce the likelihood of burning. I have also learned (the hard way!) to bring my timer with me to the basement to make sure I hear it go off. I have one pot, that's stainless, so I prefer to use it for making jam/jelly or cooking acid things like tomato soup/sauce. The problem is it has a thin bottom, and stuff scorches so easily in it. I have to really watch that pot carefully. I never knew that silicone mats helped prevent burning the bottoms of baked goods. That's good to know, in case I should ever have a set. Sorry but as bad as yours looked in that photo, I would have thrown them away. The calorie count for burned cookies would not have been worth it to me! The trick to not burning cookies- insulated pans (I have 2 and haven't burned a cookie in over 25 years) and keep checking on them LOL. When people ask me how long to bake something I tell them you can't rely on that number- you have to keep checking. now I didn't think about whether or not the calories were worth it for those 3 that I ate with the burned portions still on them!! I do know that I eat lots of things that really aren't worth the calories, so I guess this just falls in line with some of the other questionable food items I've eaten. (I should really learn to be more discriminating with what I eat!) And looking at that photo, again, I am kind of surprised that I ate 3 of those before scraping -- they look like charcoal! I am usually very vigilant about baking times/temperature. This day, I was just trying to do too many things, with too little sleep the night before. You are absolutely right, one person's oven/bakeware will result in a different time or temperature for baking than another's. And it's just so wise to keep checking (and begin the checking several minutes before a recipe calls for it to be done). My husband burned the bottoms of apple turnover. Apparently his practice of sprinkling water on crust encouraged the opposite, especially when the turnovers were baked on a metal cookie sheet. We tossed the burnt turnovers into the freezer. Although the worst turnover I've eaten, we still managed to eat above the burnt bottoms. Somehow freezing helped loosen the burnt parts so was easy to peel away. Interesting, YHF, that the freezing would loosen the burned portions. I'd definitely salvage those turnovers! Yum -- apple turnovers! Thinking about this further...turnover crusts are supposedly flaky so maybe that is why the burned layer just peeled away. Not sure if this works with any other dough type like cookies. Okay, makes sense about the flakiness. Totally normal, Lili. If I can "fix" a food mistake, it certainly happens at our house! I have the insulated baking sheets and since I've had those, cookies have never gotten burnt, just overdone at times. I have definitely scraped burnt cookies in the past, and scrape toast and buns whenever needed. Thank you! "Normal" is how I like to think of this! Sometimes the tops will just get eaten off and the burnt bottom bits remain, complete with teeth marks. It is a mystery who in our family does this. Oh now, that's too funny!! I am imagining a plate with a few of those obviously chewed-off cookies, sitting on the counter! Hmmm... I think I'd probably take the same approach as nicoleandmaggie - too lazy to actually scrape them! Before kids, I rarely baked, much for the same reasons as you, just didn't think I could keep myself from eating a batch of cookies in one day. Not so much because of a sweet tooth, but a batch of cookies are already made, whereas anything else I would have to do something to prepare it. More laziness than junk food "addiction". Piggy-backing a little on TG's story, if you had to grate/scrape off a lot, another way to salvage your time, effort and materials might be to make them into cookie crumbs. I have done that with cookies we couldn't eat up in a timely manner and cakes that stuck to the pan or fell apart (some GF recipes I've made make "exploding" cake.) The crumbs stay nice in the freezer quite a while, like bread crumbs or cubes, and are fast to thaw when you need them. Old cookies, crumbled up, make a great bottom layer under pudding! And brownie crumbs are the perfect thing for a batch of "dirt" pudding! Most of the time, though. we manage to eat everything quickly, or else don't care that something is stale. Always hungry people in this house!! Burned fish patties -- now there's a smell I hope to never smell! Yeah, I felt pretty mad at myself when I discovered the bottoms of the cookies were so badly burned, not just a little too brown, but very badly burned. Oh well. Now that's exactly what I would expect from someone as sensible as you!! I have scraped off burnt cookies and thrown whole batches away. Depends how frugal I feel...lol. Buying cookies is just easier for me. By buying cookies, if you DO find a burnt one, at least you know you can get a new package, and not have to scrape the bottom off the burnt one! Sorry, i don't scrape. My husband has eaten the offending cookies on occasion, but i feel like my time is better served doing something else. I've thrown away a lot of cookies through the years. I wonder if you could slice the burn off? Scraping is just so tedious to me; like watching paint dry. Does this kick me out of the frugal club? Ha ha! Not at all -- we all have out "things" that we do to save money, spend our time wisely, etc. And if you can find other ways to spend that same time, and be economical with time/resources, then go to it! Yeah, I would scrape them too. I like the cheese grater idea Patience had!